A recent survey of 506 marketers indicated that 36 percent of respondents reported an increase in sales from buy button integration into social media and email interfaces. That percentage will likely increase in 2016 with 60 percent more marketers projected to utilize buy buttons throughout the year. Selling through social, social commerce, is a hot topic and one to watch as marketers look for more ways to connect with consumers. Companies use buy buttons and the like within social networks like Facebook to increase their visibility to the consumer, have one-on-one conversations with potential buyers, and make it easier to bridge the gap between consumers and brands. With the insights gained from the analytics provided by various social networks, companies are armed with more data about customers and a greater ability to personalize offerings. 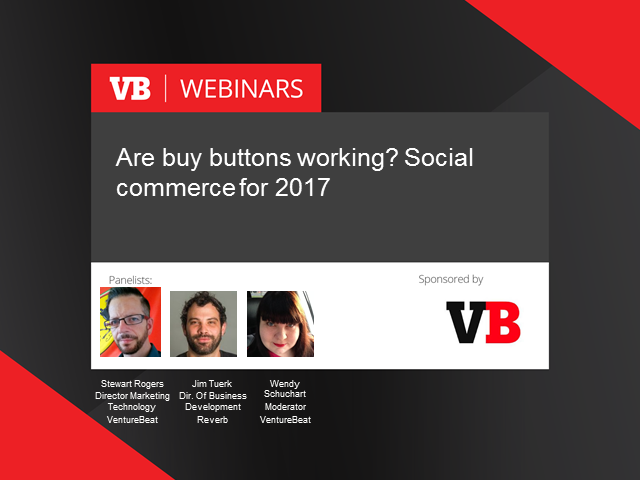 Join VB experts and panelists as they suss out trends to watch in the social commerce space.